Manga Mondays is a meme hosted by Alison at Alison Can Read where bloggers can share their passion for reading mangas. It's a great place to get new manga titles to try and to meet new bloggers. At the moment, I've got sucked into the world of Nana where love is constantly entangled with music, heartache, and happiness. Description: As Blast gears up for their major label debut, their fan club starts mobilizing. Led by the chic Shion, these ladies are serious fans who won't let anyone mess with their band. But the fan club has it out for Misato, a maverick fan who has gotten too close to Nana. What will they say when they find out Misato is applying for a job with Blast?! Review: Volume 14 was a disappointing read. 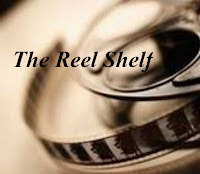 There was a lack of organization and jarring transitions between the different story lines. We get a glimpse at the rabid Blast fan base as hoards of groupies wait and crowd a hotel waiting for their favorite band to show up. This story line really did nothing for me and I didn't think it added much to the overall story arc of Nana too. I was a bit confused as to why Yazama added it. 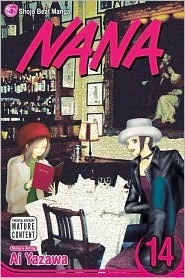 As you probably notice if you're following my reviews of Nana thus far, happiness is very temporary in this series. It seems as if the characters are desperately scrambling to stay a float and trying not to get disappointed when they don't meet their sky high expectations. We do get this familiar melancholy current when we learn something crucial about Ren, particularly his current relationship with Nana and his past with Reira. Ren and Nana O. have many similarities, which be why they are so drawn to one another. Nana O. was abandoned at a young age and Ren grew up in an orphanage. Both use music as their lifeline and identity. Now Ren seems like he is losing everything. He opens up to Reira how insecure he feels around Yasu, his best friend and from my perspective how Ren wanted his life to be. What is admirable about Yasu is that he is isn't a very emotional person-that is he thinks things through logically and calmly. He does things on his own terms, not because he is pressured to do so unlike Ren. For Ren, his band Trapnest is slowly suffocating him and making him numb. So numb that he has taken to cocaine to make him feel something. Ren and Reira take a ride to get away from the band for an afternoon. They both recall memories of when they first met, which I believe this takes place before Ren and Nana O. meet. I wasn't surprised to find out that Ren had a crush on Reira. Reira is an attractive girl with a great voice and a nice personality. What surprised me is how Ren described Yasu pursuing Reira and how he wished he could do the same for Nana O. It's clear that both Ren and Yasu wanted Reira, but Yasu went after Reira and made it happen. Presently, Ren has Nana O., his proposal of marriage is what binds her to him, but Ren is still afraid of Yasu who he has always known carried a torch for Nana O. for as long as they could both remember. What frustrates me about Ren is that he has made himself to be the unwanted loser and be more codependent then he has ever been before. He definitely is a drifter and can leave the band. He does mention that he would want Nana O. to leave Blast and be with him. don't understand what stops him from leaving Trapnest. It's hard to know what he wants because he emotionally shuts down and refuses to talk. Meanwhile the paparazzi spy Ren and Reira together in hugs and other poses that look like they are having an affair if you didn't know what was happening. Those photos are then given to Nana O. as a "present" by the tabloid company and I'm sure all hell is going to break loose in the next volume. Words of Caution: Drug use, sexual situations, and crude humor. Recommended for mature teens and adults only. Too bad the volume wasn't as good. Seems like every series has its weak editions. I do kinda like that happiness is temporary in this series. So many manga series are perpetually perky. Sorry for the late response. My parents were in town so I didn't blog much. Author Interview with Elisabeth Doyle + Giveaway!